Highly Flexible Heat-Shrinkable Woven Fabric. HFT5000 is made from a very flexible heatshrinkable fabric and at a temperature above +110ºC shrinks to fit securely around a range of shapes and sizes. 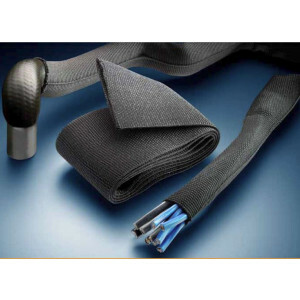 Designed to provide mechanical abrasion protection, noise and rattle suppression, for components such as rubber hoses, plastic pipes, and harness wiring b undles. The woven construction makes HFT5000 extremely flexible and resistant to trapping water, heat and humidity. It also provides outstanding abrasion, chafing and cutting protection, even at high temperatures.